Opera today launched a new version of the Opera browser for computers to make other browsers obsolete. 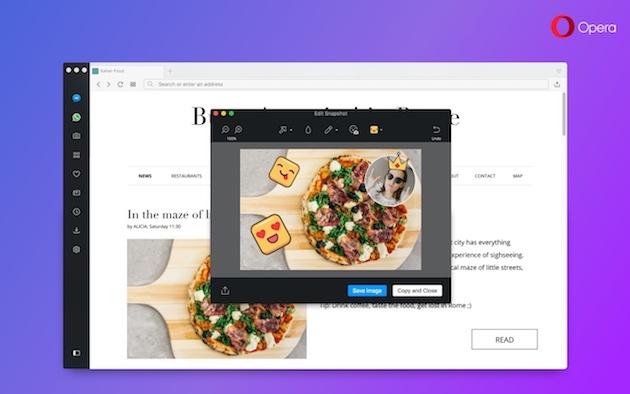 This includes a fun snapshot editing tool, a handy search pop-up tool, integrated popular social messengers and support for watching online video content using VR headsets to make web browsing even more interactive and convenient. In May, Opera became the first major browser to add support for popular social messengers as a sidebar in the browser. With this release, the list of supported messengers now includes Facebook Messenger, WhatsApp, Telegram and VK. By integrating these web-based services, Opera enables people to use their desktop computers like they use their mobile devices without needing to install additional software or extensions. In this stable release, Opera provides a built-in VR 360 video player. This feature was introduced in Opera 49 developer version, making Opera the first desktop browser to support 360-degree video streaming to most virtual reality headsets today. Owners of HTC Vive, Oculus Rift and other OpenVR-compatible devices can now easily view the quickly-growing library of awesome 360-degree content. A new Easy Setup menu provides a shortcut to commonly-configured features for quick browser adjustments. 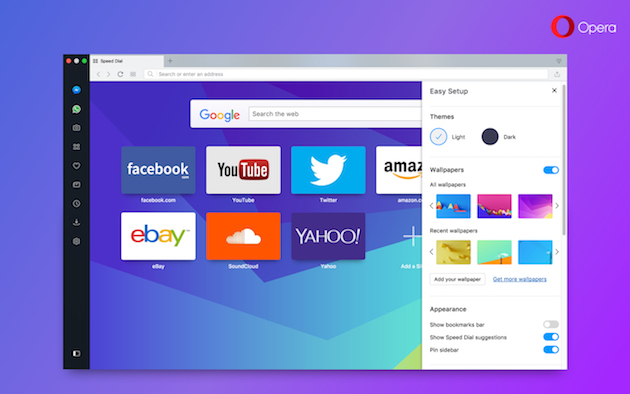 This helps you customize how the Opera Reborn browser will look with themes, designer wallpapers, bookmark and sidebar options and so on. Also, users are able to tailor Opera’s top features such as ad blocker, configure download locations and clear browsing data. If you are switching from another browser, Easy Setup also makes it simple to import bookmarks and data from your old browser and make Opera your new default browser. The search pop-up tool can currently convert 32 units of measurements, 14 time zones and now 37 currencies, including five newly added ones such as Ukrainian hryvnia (UAH, ₴), Kazakhstani tenge (KZT, ₸), Georgian lari (GEL, ლ, ₾), Egyptian pound (EGP, E£) and Belarusian ruble (BYN). Users can simply select the price and get it converted to their default or selected unit, currency or time zone immediately. Extension icons, placed to the right of the combined search and address bar, can be rearranged. Refined private mode. The private window now closer resembles the regular light theme mode of Opera with an appropriately matched dark address bar. The browser has been sharpened to look its best on HiDPI screens. Opera browser for computers had its strongest double-digit growth in 2017. The number of monthly active users has increased over 25% YoY. In the US, it was a record growth of 65% over the same time last year. Users in France has increased 64%, UK with 50%, followed by Italy (40%), the Netherlands (34%) and Germany (27%). The growth represents users welcoming the unique features that Opera Reborn has offered and craving for a change of using a modernized browser that can help them multitask and interact with others on the web easily.